Adolf Hitler and his entourage expressed keen interest in Crimea already in the pre-war period. Robert Ley, Head of the German Labour Front, had a dream to turn the peninsula into a big resort for Germans. The Fuehrer was eager to make Crimea a German Gibraltar, which would allow him to gain control of the waters of the Black Sea. Adolf Hitler and Alfred Rosenberg, Reich Minister for the Occupied Eastern Territories, planned to oust Jews and Russians from the peninsula after the war, to rename Crimea Gotland and colonize the territories. Rosenberg suggested uniting Crimea, the Kherson and the Zaporozhye regions into the Tavria District. The Nazi ideologist visited the peninsula. After seeing the battlefields, he wrote in his diary: “Sevastopol has been ruined by our air forces and artillery. Only the remaining witnesses of the ancient Greek civilization are the columns and Museum.” Rosenberg, who was born in Revеl (now Tallinn) and had spent 25 years in Russia, realized like no other, how precious the Crimea was for Russians, how much it meant for them. The most terrible thing was that the enemy sought to strip the Soviet people off the right to live as well as hope for a happy life. Jostling for living space, the Nazis and their supporters treated the indigenous population with the gloves off. 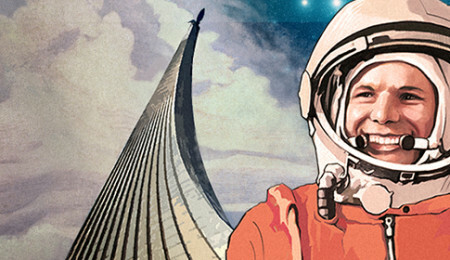 Apart from symbolizing a happy Soviet life, Crimea was of great military, political and strategic importance. Later, Soviet Marshal Alexander Vasilevsky stated in his memoirs: “Crimea allowed Germans to keep threatening the Black Sea region and to exert pressure on Romanian, Bulgarian and Turkish policies. Crimea was used as a foothold for the Nazi invasion into the Soviet Caucasus and stabilization of the entire southern wing of the front”. The Wehrmacht heavy defeat in Kursk made it clear that the complete liberation of the Soviet Union was just a matter of time. On 1 November 1943 the 4th Ukrainian Front under the command of General Fyodor Tolbukhin attempted to pierce the defenses in the north and recapture Crimea. The 19th Armored Corps under Lieutenant General Ivan Vasiliev made its way through the enemy’s fortifications at Perekop. Although the fierce resistance allowed Germans to temporarily block the Soviet tanks, the 51st Army under Lieutenant General Jacob Kreizer soon joined the Corps. Thus, an important bridgehead to play a significant role in the liberation operation was established. Our valiant warriors set up two more bridgeheads, one to the north-east of Kerch and the other on the south shore of the Sivash. Farmer Vasily Zaulichny was the first to show the way thought the Rotten Sea to our scouts and forward echelons. He was awarded the Order of the Red Star for his feat. Another guide through the Siwash was the 68-year-old Ivan Olenchuk. 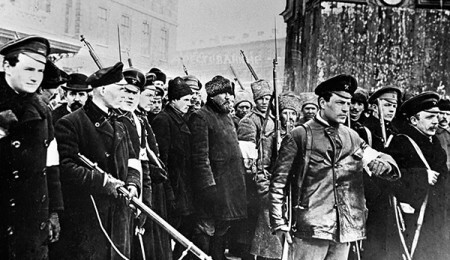 In early November, 1920, he led the Red Army to the rear of Peter Wrangel’s White Army. Ivan did not let the Soviet troops down 23 years later. The German troops did stand idle. For example, the enemy created three powerful defensive lines, which were 14 km long and 35 km deep, in the Perekop District on a narrow part of the isthmus. The main defense line which was 4-6 km deep, had three defensive positions with normal trenches, pillboxes and bunkers. Armyansk was central to the defense. Numerous barricades were erected in the streets. All in all, the enemy deployed up to 20 thousand troops, 325 guns and mortars, 50 tanks and assault guns in the Perekop District. The Crimean offensive was to see the combined efforts of the 4th Ukrainian Front deployed at Perekop and the Sivash and of the Independent Coastal Army under General Andrei Yeremenko at the Kerch bridgehead. They were to move towards Simferopol and Sevastopol and with the support of long-range air force, the Black Sea Fleet and the Azov flotilla and militia to degrade and ultimately defeat the enemy, preventing its retreat from the peninsula. The Black Sea Fleet under Admiral Filipp Oktyabrskiy was predominantly tasked with cutting off the enemy’s lines of communications with Crimea. In addition, the fleet was expected to assist the Red Army with aviation and naval artillery fire along the coast. The 4th Ukrainian Front commanders realized how powerful the enemy’s defense in the Perekop area was and decided to deal a major blow at the Sivash. The main tank forces were deployed there. It was believed that after attacking the enemy from the rear they would launch an offensive further into the peninsula. Our ancestors were driven by the strong desire to drive the German and Romanian troops from Crimea and looked forward to the battle. However, the sea was stormy and roads were poor after the rains. The bad weather made Russians postpone the operation but once. While breaking through the enemy’s defenses, officers and men of the Red Army exhibited a high level of heroism. The decoration certificate of Commanding Officer of the machine-gun unit in the 262nd Guards Rifle Regiment and Senior Sergeant Alexander Korobchuk holds that on April 12, in the battle near the Ishun village (in the outskirts of Krasnoperekopsk), “leading other soldiers he was the first to attack the foe’s trenches with grenades; as a result, 7 Nazi soldiers were killed”. When there were no grenades left, the machine-gunner courageously jumped to block a pillbox with his body. On April 13 the Soviet forces retook control over Yevpatoria, Feodosiya and Simferopol. As part of preparations for retreat, German soldiers planted bombs in the most important buildings of Simferopol, with the intention of blowing them up together with Soviet soldiers. Yet Crimean partisans managed to prevent the Nazis from committing the crime. In his memoirs Sergei Biryuzov wrote that “we entered the city covered with powder smoke, while in its southern and eastern parts the battle was drawing to an end. Some houses and even blocks were destroyed. However, Simferopol, in general, remained intact. Our aggressive assault did not allow the adversary to implement its evil plans on the annihilation of residential houses, cultural sites, parks and squares. As it was the spring, the city with really beautiful. Everything was green and in full blossom”. The day before the liberation of Yevpatoria, the Ashag-Dzhamin village (today known as Heroyskoye) in the Saky region witnessed a two-hour asymmetric battle between the Nazi forces and 9 reconnaissance officers of the 3rd Guards Engineering Brigade and the 91st Separate Motorcycle Battalion, including Commander of the Guards Group, Sergeant Nikolay Poddubny, his deputy, Junior Sergeant Magomed-Zagid Abdulmanapov and Privates Pyotr Veligin, Ivan Timoshenko, Mikhail Zadorozhny, Grigory Zakharchenko, Vasily Yershov, Pyotr Ivanov and Alexander Simonenko. They repulsed several attacks of the enemy. When they ran out of bullets, the wounded soldiers bleeding to death resorted to fist fighting. The Germans tied the brave warriors up with barbed wire, and in an attempt to obtain needed evidence, they started to brutally torture the captives. They were beaten with rifle butts, and bayoneted; their bones were broken to pieces, and eyes were put out. However, the Nazis failed to get any information. And then one of the German officers addressed the 19-year-old Avar Abdulmanapov, “Well, they are Russians, but who are you? Why are you keeping silent? You are alien to them. Everybody should care about their own lives. Where are you from?”. When asked such questions, Magomed-Zagid answered directly, “It is clear where I am from. We are all children of our Motherland” and spat at the enemy’s face. After the tortures the heroic Red Army soldiers were shot dead not far from the village. On May 16, 1944 the Presidium of the Supreme Soviet of the USSR awarded 9 reconnaissance soldiers the title of the Hero of the Soviet Union. One of them, a 24-year-old machine-gunner Vasily Yershov, mysteriously survived. Local residents found the hero only to see that he had ten gunshot wounds and seven bayonet wounds. Moreover, his jaw was fractured. For all his life, Yershov born in the Sandovsky District (Tver Oblast) was disabled. Following the war Vasily attended the battlefield and local citizens welcomed him as their best friend. Soviet pilots were also struggling heroically. On April 22 the 134th Guards Bomber Aviation Regiment received an order to make airstrikes against the enemy airfield with more than 50 planes. Soviet troops were met by barrage fire of air defense batteries. One of the projectiles hit the plane of Air Mission Commander and Major Viktor Katkov. General Grigory Chuchev, then Commanding Officer of the 6th Guards Bomber Aviation Division, recalled that “the commander rapidly plunged the burning jet into a dive, thus trying to extinguish the burning wing. While doing this, the pilot aimed at the target and dropped the bombs on the foe’s aircraft at the border of the airfield. During the recovery from the rapid dive the plane began to burn again. Only after accomplishing his mission Major Katkov disengaged from the battle, turned his plane around towards and started landing. At the same time, the flame was approaching the cockpit of the pilot and navigator. Within several minutes the fire started in the cockpit itself. The pilot made wheel-up landing on broken ground. For some time the plane moved and then stopped. It was impossible to move the aircraft canopy out, which is why the pilot and navigator could not be ejected out of the cockpit. Practically the whole plane was in flames and the explosion was about to happen. Without any delay Senior Sergeant D.I. Odinoky, a radio-gunner, left the cockpit and risking his life, he ran to the burning plane. Using his tremendous force, Odinoky broke the plexiglass of the aircraft canopy with his legs. At first he helped the group commander and then the burnt navigator. Within several seconds the plane exploded”. The worse the situation in the front line was getting for the foe, the more brutal Germans, Romanians and their allies were acting in Crimea. They endeavored to take out everything which had been grabbed during the occupation. And the most terrible fact was that the Nazis were slaughtering civilians, including children and senior people. On April 18, 1944 the Red Star newspaper issued the “Appalling Crimes of the German Army in Old Crimea” report of Major Prokofiev. It stated that “near the entrance hall of the house, where doctor Fedotov had died under the occupation, the Nazis shot dead his 64-year-old wife Elena and her neighbor Marina Chizhova. Not far from this place, there was a pool of blood. Here a 14-year-old boy, Rustem Kadyrov, was killed by a scoundrel German soldier. We also saw bloody traces of crimes of Hitler’s forces in the Severnaya and Armyanskaya streets where the houses are empty, because the Germans have massacred all their residents. On April 12, 1944 Germans shot down and bayoneted 584 people in Old Crimea!”. Meanwhile, till the eleventh hour Adolf Hitler clung to the hope that he would be able to maintain control over Crimea. The psychotic Fuehrer turned a blind eye to the demands of Romanian dictator Ion Antonescu to withdraw the Romanian troops from Crimea. And the doubts of Commander of the 17th German Army, Colonel General Erwin Jaenecke about the possibility to further control Sevastopol cost him his office. Hitler replaced him with Infantry General Karl Allmendinger whose order on May 3, 1944 made his subordinates aware of the following facts: “I have been ordered to defend every scrap of Sevastopol’s land. You are aware of its strategic importance. Not one name in Russia is uttered with greater reverence than Sevastopol. Here there are monuments of the previous wars…..Given Sevastopol’s historical significance, Stalin wants to regain control over the city and port. Therefore we are enabled to shed blood of the Red Army soldiers who are numerically stronger on this frontline. I demand that our forces be on the defensive, in the true sense of this word. Nobody must retreat. Instead, we must retain control over every trench, hole and ditch”. And our troops were destined to seize these trenches and ditches. Multilevel fortifications of Sapun Mount with 63 pillboxes and log pillboxes looked especially menacing. They were stormed by the 63rd Guards Infantry forces of Major General Pyotr Koshevoy and the 11th Guards Rifle Corps forces of Major General Serafim Rozhdestvensky. Following the war Pyotr Koshevoy wrote about those days, “fighting was becoming fierce along the frontline. The advance of the forces slowed down everywhere. <…> Under clouds of dust and smoke our soldiers and the adversaries resorted to fist fighting over and over again amid the explosions of projectiles and mines. <…> Trenches changed hands from one party to another three times. Everything was burning around, but the enemy’s shadow did not recede”. While approaching Sevastopol, Lieutenant Mikhail Dzigunsky, Sergeants Fyodor Skoryatin and Stepan Pogodaev, and Private Alexander Udodov (he was seriously injured but was able to survive) repeated the feat of Alexander Matrosov. Four soldiers along with 122 liberators of Crimea were awarded the title of the Hero of the Soviet Union. And Commander of the squadron Vladimir Lavrinenkov, who managed to escape from captivity to join partisans, received the second Gold Star medal. 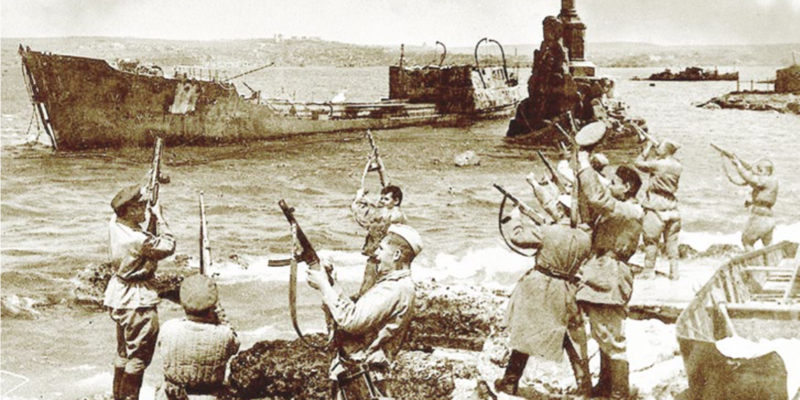 On May 9, 1944, a year before the victory in the Great Patriotic War, Sevastopol was liberated. 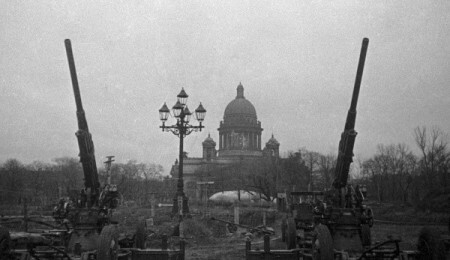 A sailor shirt and cap planted on the arc’s rod at Grafskaya Quay served as a symbol of the victory. Three days after it, the Crimean peninsula was freed of invaders. 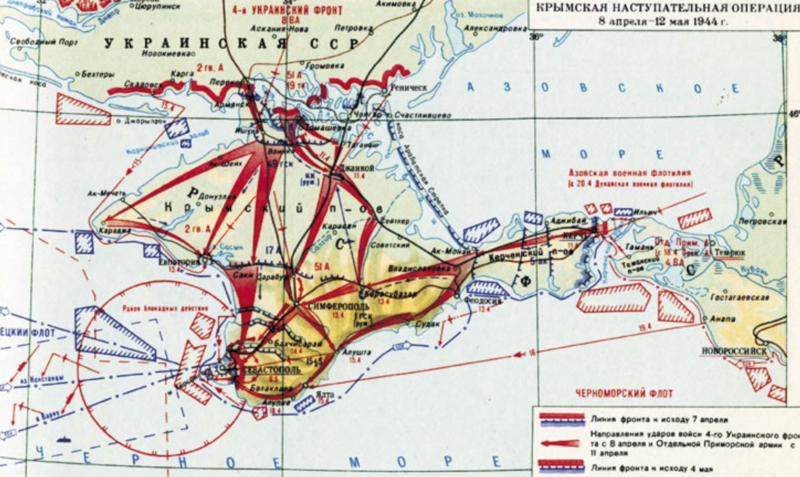 Summarizing the outcomes of the Crimean Offensive, Russian historian Mikhail Myagkov states that “total battle-deaths among German and Romanian formations exceeded the Red Army’s losses. Whereas this strategic operation claimed the lives of 13 thousand Soviet soldiers and wounded 54 thousand people, Germans and Romanians lost no less than 60 thousand people taken prisoners. Overall, they faced the death toll of over 140 thousand soldiers and officers. That was an outstanding offensive in a series of the 1944 decisive blows of the Red Army. The assault was carried out by commanders and the rank and file who went through harrowing or bitter experiences from 1941 to 1942. From now on the Red Army was going to put to the sword its archenemy in revenge for wreaking havoc on Crimea”. 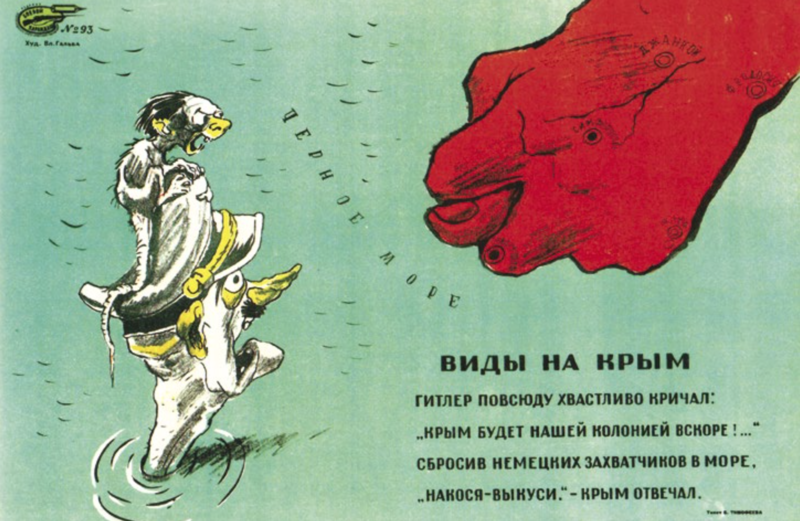 The dream of Soviet citizens came true – eventually, Crimea was liberated by the Red Army. Reflecting our popular sentiments, in his essay published in the Izvestia newspaper Konstantin Paustovsky triumphed in the following way, “Blessed places! Now they are forever ours!”. Shortly after that, the Maly Theatre front-line brigade arrived in Sevastopol. On the local stage actors performed in the “Guilty Without Fault” and “In a lively place” plays by Alexander Ostrovsky, the greatest Russian playwright. Within several days Sevastopol’s residents watched the “Two soldiers” (or “Two Warriors”) film shot by a prominent Soviet director and screenwriter Leonid Lukov. The life on the peninsula was quickly getting back to normal. In early February 1945 Crimea hosted the meeting of the heads of the major Allied Forces. In Yalta Joseph Stalin welcomed US President Franklin Delano Roosevelt and British Prime-Minister Winston Churchill.